Brittle bushes are native to the lower Sonoran desert and therefore need almost no special care here to stay alive. However, they will look nicer with a little bit of water in the hottest part of summer. If not watered during summer a brittle bush will go dormant and drop most of its leaves. 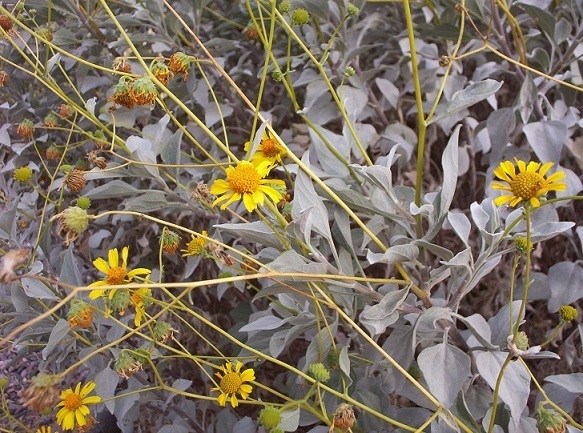 Brittle bushes are related to sunflowers and give off a wildflower type fragrance when blooming in late spring. They have an attractive blueish grey foliage and form a medium size rounded shrub which can get too open and messy looking if not trimmed back at least once a year. This trimming is convenient to do after flowering, because both the outside foliage and dried up flower heads can be removed at the same time. Brittle bushes are somewhat prolific via seeds, so they require a small amount of weeding around them to keep them from turning into a thicket.